Jim Cotter put a fresh coat of paint on a stairwell in Glouster, Ohio. Jim Cotter grew up in the small town of Glouster, Ohio. He remembers Glouster being a busy coal-mining town when he was a boy. Over time, the town changed. Coal mining became less important there. This made it harder for people to find jobs. The town started to look worn down. People had little money to paint or make repairs to homes and businesses. Mr. Cotter wanted to do something to help the people of Glouster. He wanted to make the town look nicer. He once owned a sign-making business. Now he is retired and has more free time. So, he decided that he would paint the town. He started out small with a fire hydrant and a guardrail. Then he began painting people’s homes and businesses. Mr. Cotter does this work as a volunteer, or someone who works without pay. He also uses his own money and donations to buy paintbrushes, paint, and other supplies. Donations are gifts of money. Soon Mr. Cotter got a group of volunteers in Glouster to help him paint. Over time, people from other states also wanted to help. One day, about 260 people from other places showed up to paint. Together, they painted 17 homes in Glouster. 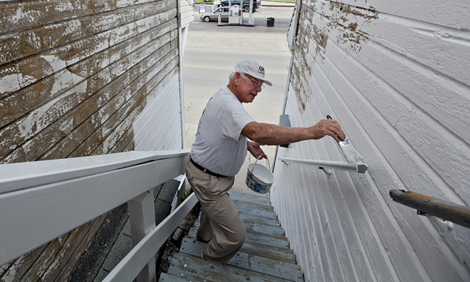 Mr. Cotter wants to do more than paint the town of Glouster. He also wants to inspire other people to make their communities nicer places. What was Glouster like in the past? It was a place where paint was made. It was a busy coal-mining town. It was the busiest town in the country. It was an important farming community. How is Jim Cotter helping Glouster?